In the past few years, Against The Current has evolved from an upstart YouTube cover band to an unstoppable, hardworking trio ready to take over the world with their attention-grabbing and witty pop rock songs. Now, armed with their latest album “In Our Bones“, Against The Current finds themselves a more practiced and thoughtful band than ever. POPSPOKEN: What has the band been up to lately? Chrissy: We just finished Warped Tour and are now in the midst of rehearsals for the In Our Bones tour. POPSPOKEN: What’s one memorable thing about playing shows in Singapore? Chrissy: Southeast Asia as a whole is just an entirely different realm compared to the rest of the world. The places we’ve seen and the people we’ve met are unforgettable. POPSPOKEN: Why do you think your band was named Rock Sound’s “Hottest Band on Warped” this year, and how did you celebrate? Chrissy: We’re honestly just honored. It’s hard to see ourselves through the same perspective other people do so we are just very appreciative of the recognition. POPSPOKEN: What is your favourite song off your latest album “In Our Bones”, and why? Chrissy: There’s absolutely no way to choose a favorite. We went into this record with the goal of having every song stand for itself and having no deep cuts or filler songs and I think we accomplished that. 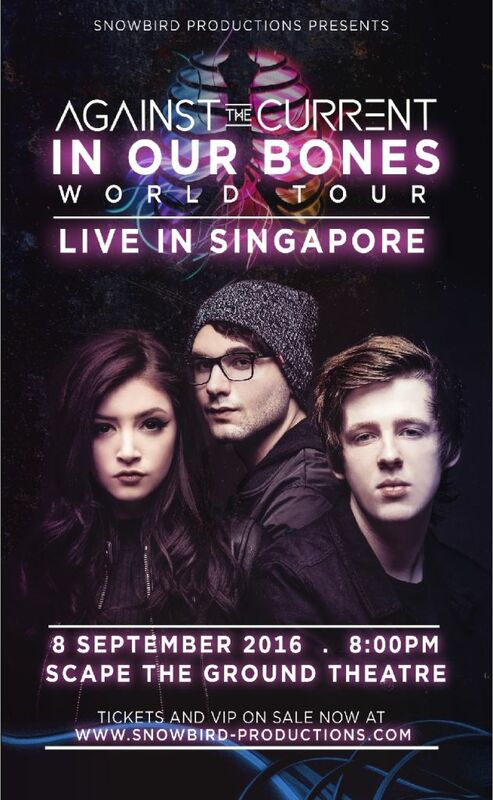 POPSPOKEN: Can we expect anything unexpected during the In Our Bones Asia + Europe tour? Chrissy: The set is very different than it has been in the past and there’s a new addition to it. POPSPOKEN: Lastly, how would you like Against The Current to be remembered? Chrissy: We just want to be remembered in general! Ticketing: $88 (Early Bird) – $148 (VIP inclusive of meet & greet). On sale now at from Peatix (http://atciobsg.peatix.com).